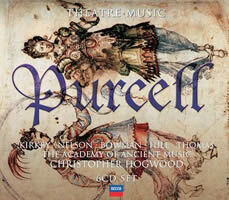 Henry PURCELL: Theatre Music 1: Amphitryon, or the Two Sosias, Z. 572 (1690); Sir Barnaby Whigg, Z. 589 (1681); The Gordian Knot Unty’d, Z. 597 (1690); Circe, Z. 575 (1689). Aradia Ensemble, Kevin Mallon (dir.). Naxos 8.570149 (http://www.naxos.com/). 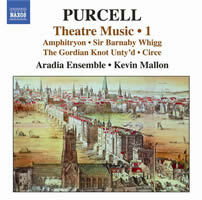 Purcell’s incidental music for the stage shows genius paying the bills, so it makes rough sense that Aradia Ensemble is clipped and businesslike. Percussionist Edward Reifel’s prominence in the mix nails the approach. The light-toned vocalists (nine cuts out of 26) work best en masse, responding to solos in Charles Davenant’s Circe. Dedicated Purcellians will want AAM / Hogwood’s six-CD Decca box — tempos that allow some grandeur, stylish singing, ample documentation. 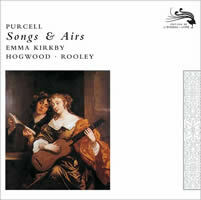 Henry PURCELL: Songs & Airs. Emma Kirkby (sop), Christopher Hogwood (org, spinet), Anthony Rooley (lute), Richard Campbell (vdg), Catherine Mackintosh (vln). L’Oiseau-Lyre 475 9109 (http://www.loiseaulyre.com/). Distributed in the US by Decca Classics (http://www.deccaclassics.com/). Turning to Kirkby’s celebrated 1983 recital (silvered last year) is a great pleasure. The opener, “Hark! Hark! How all things,” features phenomenal agility in decorative passages. Such accuracy was dubbed “instrument-like” — no prevailing vocal standard applied. Pure, steady intonation is joined to appealing restraint. She subtly details misfortune in “Bess of Bedlam,” followed by a jaunty “Lovely Albina’s come ashore.” Or the Halleluias in “An Evening Hymn,” each sculpted differently. 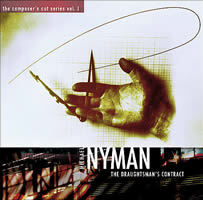 Michael NYMAN: The Composer’s Cut Series Vol. I: The Draughtsman’s Contract (2005 version). 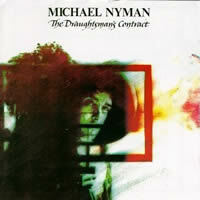 The Michael Nyman Band, Nyman (pno, hpsi, cond.). MN Records MNRCD 105 (http://www.mnrecords.com/). Distributed in the US by Naxos (http://www.naxos.com/). I’m not sold on movie music outside its original purpose, but Purcell arranged his theatre scores into suites for publication. He also provided Baroque cells for Nyman’s trademark pattern-making in this 1982 effort. The revision projects everything larger, even angrier, than I recall from Peter Greenaway’s film. (The soundtrack album still exists, on Caroline.) A watery death has stomping wit, and the lock-step playing never falters — Nyman’s brass section must possess bionic lips and lungs. 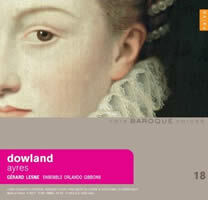 John DOWLAND: Ayres. Gérard Lesne (alt), Ensemble Orlando Gibbons: Anne-Marie Lasla, Kaori Uemura, Sylvie Moquet, Emmanuel Balssa (viols), Jacob Heringman (lute). Naïve E 8919 (http://www.naiveclassique.com/). Distributed in the US by Naxos (http://www.naxos.com/). Another valuable reissue, from 2004. I saluted Lesne’s Caldara CD here; the sole smudge on his Dowland is some cloudy enunciation. His grasp of the idiom trumps that, while a refined viol-quartet accompaniment (plus Heringman’s lute) elevates this above the norm. The viols get seven solos, and room to stretch out elsewhere. Most of Dowland’s “hits” appear but the highlight is the three-part Thou mighty God, exhibiting Lesne’s skill at declamation. Faultless perspectives and stimulating notes. 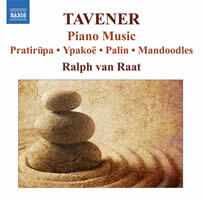 Sir John TAVENER: Piano Music: Zodiacs (1997); Ypakoë (1997); Palin (1977); Mandoodles (1982); Pratirupa (2003); In Memory of Two Cats (1986). Ralph van Raat (pno). Naxos 8.570442 (http://www.naxos.com/). The firm of Bunkum, Hoohah & Tosh.